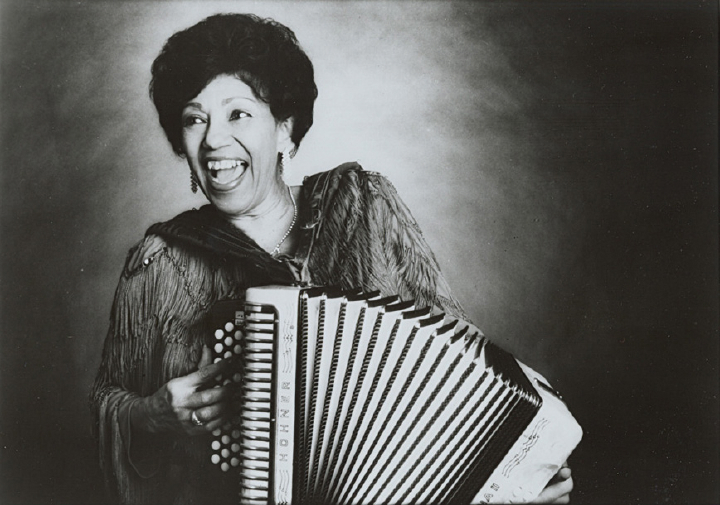 “Queen” Ida Guillory was born in a French-speaking community of rice farmers in the Lake Charles area of south Louisiana. As a young person, she helped cook for field hands and drove a tractor. Her family moved, first to Beaumont, Texas, and then, in 1947, to San Francisco. As a child, Guillory listened to country music on the family’s little crystal radio. Two uncles played Cajun and zydeco, and after the family moved to California, her mother returned to Texas and brought back 78-rpm records. 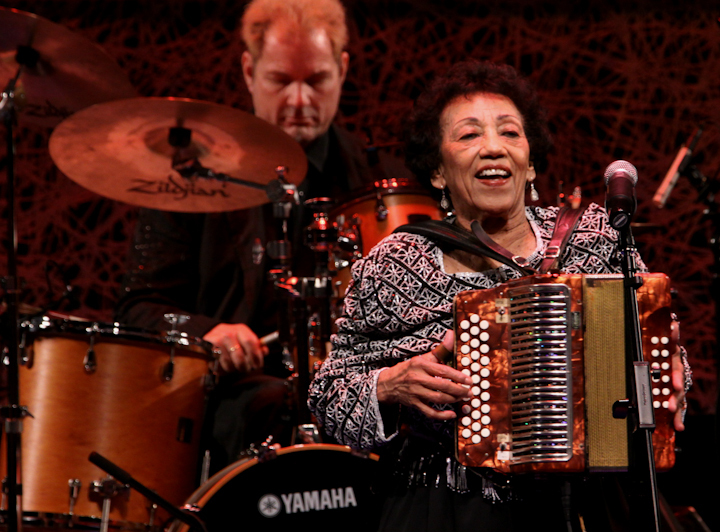 She told her sons that she wanted them to keep up the zydeco tradition. 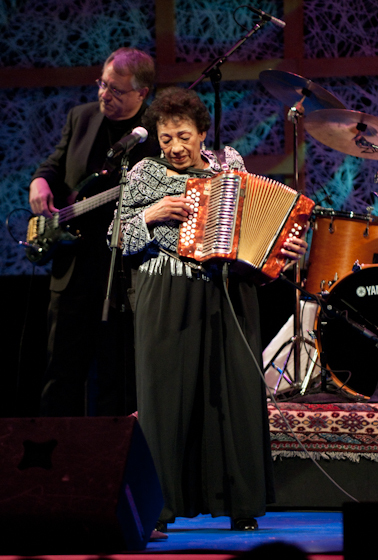 The accordion was considered too masculine for a girl to play, Guillory said. But she borrowed her brother Al’s diatonic button accordion and began learning to play the difficult instrument, which she called “that little monster.” The button accordion is similar to a harmonica in that each button will sound two notes, one when it’s pushed, the other when it’s pulled. In California, Guillory married and had three children and drove a school bus part time. 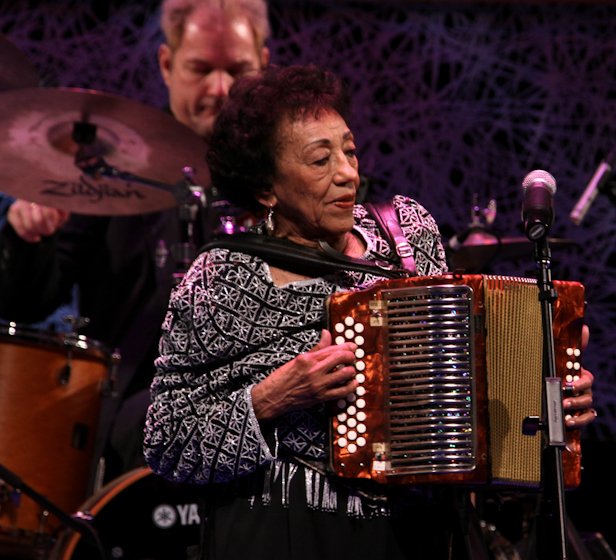 She pulled her accordion out of the closet and began playing again after hearing the music of Creedence Clearwater Revival, which reminded her of zydeco. When she took schoolchildren on field trips, she would bring her instrument and practice while waiting to drive back. She began playing at family gatherings and parties and with bands, including her brother’s. When she performed at a 1975 celebration at a San Francisco church, she was crowned queen of the Mardi Gras, and a San Francisco Chronicle reporter wrote a story on her, calling her Queen Ida. 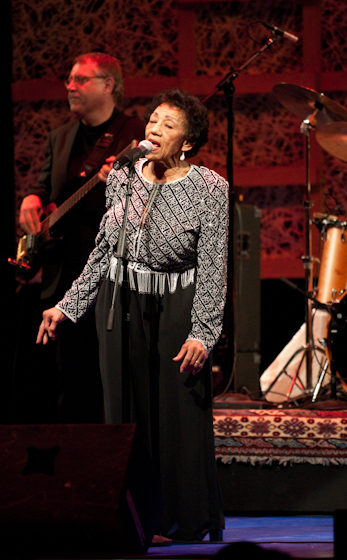 She took over leadership of the band, which soon played the San Francisco Blues Festival and the Monterey Jazz Festival. 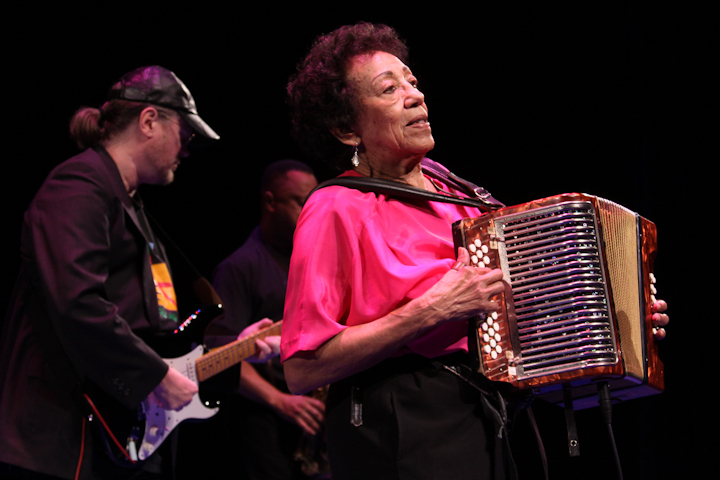 Guillory and her Bon Temps Zydeco Band have toured extensively. They have performed at Carnegie Hall with the South African group Ladysmith Black Mambazo and at a Hurricane Katrina benefit. They have performed in Japan, Australia and New Zealand and have toured several African countries through the sponsorship of the U.S. State Department. She found a particular kinship with the French-speaking inhabitants of Ghana. 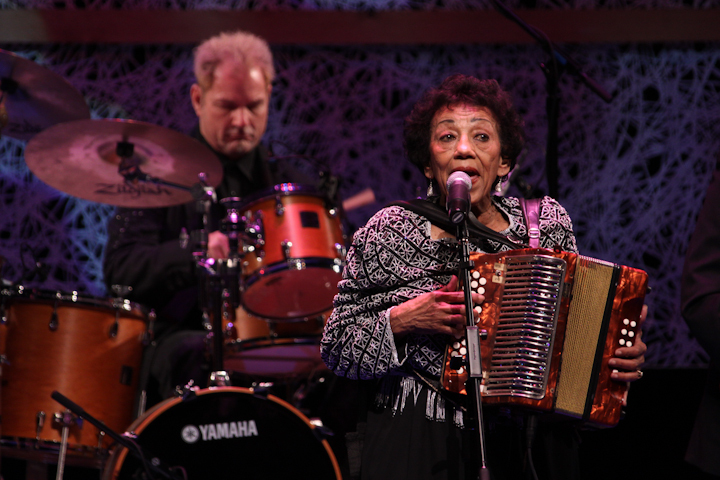 She has appeared on the public radio show A Prairie Home Companion, on television on Austin City Limits and Saturday Night Live and in Francis Ford Coppola’s film Rumble Fish and in J’ai Ete au Bal, a Les Blank documentary about Louisiana music. Her 1982 On Tour album won a Grammy, and she has co-authored a cookbook. For many years, Guillory maintained a schedule that would daunt many half her age. With her brothers and sons playing in the band at various times and her husband as manager, she said, “I felt at home” on the road. Guillory, Ida, and Naomi Wise. 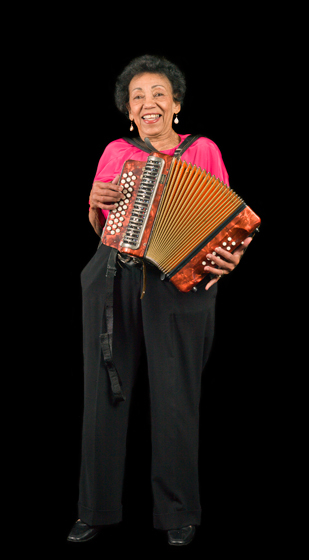 Cookin’ With Queen Ida: “Bon Temps” Creole Recipes (& Stories) From the Queen of Zydeco Music. Prima, Rocklin, California, 1990. and 1996. Guillory, “Queen” Ida. Back on the Bayou. GNP Crescendo 2265. _________. Cookin’ With Queen Ida. GNP Crescendo 2197. _________. On a Saturday Night. GNP Crescendo 2172. _________. Mardi Gras. GNP Crescendo 2227. _________. Zydeco a La Mode. GNP Crescendo 2112. _________. Caught in the Act. GNP Crescendo 2181. _________. In San Francisco. GNP Crescendo 2158. _________. 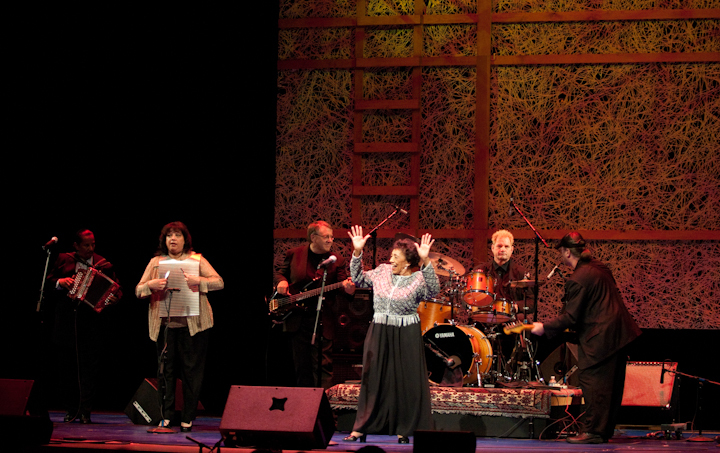 Queen Ida and the Bon Temps Zydeco Band on Tour. Crescendo 2147. Rumble Fish, 1983, American Zoetrope.